Okay, I have one thing to say about this book: Read it. If you have a kid, read it to him/her. If you don’t, read it anyway. I’m thirty-something-years old, and I’m discovering it for the first time, and all I can think of — besides how fabulous it is — is how much I wish it had been in my life when I was a kid. Yes, it’s that good. Pickle-Chiffon Pie was first published in 1967, and it has recently been reissued by Purple House Press, which reprints great kids’ classics. The illustrations in this book are absolutely fabulous. They have a certain look, that happy, charming late-sixties-look that you just don’t find in kids’ illustrations anymore. They are intricate and colorful, whimsical and lively. Just looking at them makes me happy. And the story? It’s utterly delightful. There is a king who has a beautiful daughter, and many men want to marry her. So the king takes the three nicest suitors — the buff Prince Musselbaum, the bookish Prince Wellred (don’t you love those names? ), and the plain but sincere Prince Bernard — and gives each of them a task: Go into the forest for three days and find the most unusual and wonderful and marvelous thing you can, and bring it back. Whoever brings back the most wonderful thing will win the hand of the Princess. So they do, and in the forest, there are many strange and wonderful things — a lion in a velvet vest juggling cans of root beer soup, an ogre so ugly that he scares leaves off of the trees, a giant with a green beard who plays “Chopsticks” on two tiny pianos. And each prince makes his selection and heads home, sure that he will win the contest. But Prince Bernard’s selection — a Three-nosed Snozzle who can bake the king’s favorite Pickle-Chiffon Pie — is simply not happy to go. He’s very sad about leaving the forest and his children, who have no one else to look after them. Bernard drags him along for a while, but then has to stop and reflect on his own actions. Is it right for him, Bernard, to take this Snozzle away if he desperately wants to stay at home? I won’t give away the ending, though it does end happily for all parties. And it has a pretty deep message, too, one that applies to everyone everywhere. Bernard has to wrestle with his conscience and with some thorny questions — is it okay to prioritize your own happiness above someone else’s? Is it okay to pursue your own heart’s desire if it means hurting someone else in the process? And what’s great is that these questions fit so naturally into the narrative; there’s nothing pedantic about the story at all. I honestly can’t think of a better book to teach children the value of empathy, or of putting themselves into someone else’s shoes for a while. I don’t think these qualities come instinctively to young kids, who are known to grab the best toy in the bunch and try to keep everyone else from playing with it. But kids need to become aware that our actions have a ripple effect, and that it’s important to consider how our choices will impact others. (Heck, this is a lesson that many CEOs could stand to learn.) And I can’t think of a better vehicle for conveying it than this book — this engaging, delightful book, whose profound message is packaged in charming pictures and playful prose. It’s a gem, in every way. I’ll be giving this book to Matthew for his birthday, and believe me: it’ll be hard to wait that long. But at least he’ll be discovering it at the tender age of five, instead of waiting thirty-plus years like his mom. And I can say with confidence that his childhood — heck, his whole life — is going to be happier with this book in it. 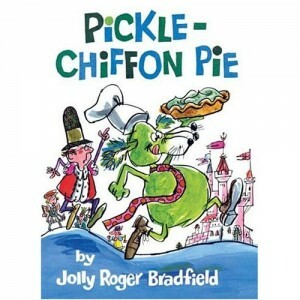 Pickle-Chiffon Pie, written and illustrated by Jolly Roger Bradfield. (Check out the author’s website for more about him and his works.) To read more about the Spiritual Books series of posts, click here. Broken toys are a pretty common occurrence around our house. (I guess this is inevitable when you have boys whose definition of “play” involves sending small vehicles flying down the hall at horrifying speed.) Whenever Scott pulls out the toolkit and reapairs the car or train in question, Matthew always looks on and issues his standard proclamation. “Daddy can fix anything,” he says. I love the faith with which he says it. It’s pure, unwavering, and adorable. And it’s the kind of faith that lies at the heart of the classic picture book The Carrot Seed. The Carrot Seed is a short, simply-worded book about a boy who plants a seed. “I’m afraid it won’t come up,” his parents tell him. “It won’t come up,” his big brother says. But the little boy weeds and waters and waits … and waits … and waits. And in the end, a huge carrot comes up out of the earth … “just as the little boy had known it would,” the narrator explains. This is so clearly a story about faith, the instinctive faith of children. It’s also a story about faith being rewarded. 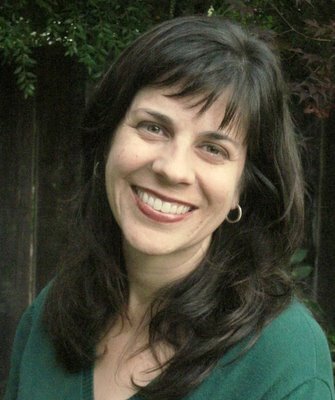 And, as a mom, I am realizing that it’s about something else, too. It’s about walking the line between protecting our kids and encouraging them to dream big. There’s an unanswered question in this book: why are the parents so sure that the carrot seed won’t grow? The drawings by Crockett Johnson (author of the Harold books, other faves of mine) show a kind-looking family with gentle, concerned expressions; they hardly seem like they get their jollies from crushing a small boy’s hopes. My guess is that they warn him in an effort to protect their little boy from disappointment. If he counts on this and it doesn’t happen, he’ll be devastated. Let’s prepare him in advance for that possibility. It’s arguably a good impulse, the desire to protect your kids from pain. At the same time, though, it goes against the grain of the natural faith of the little boy. In the end, his impulse — towards belief — is the right one. And that, it seems, is the message of this book: that good things come to those who have faith. I struggle a bit with this message, honestly, because life doesn’t always work that way. Let’s face it: there are times when we have faith, and our hopes just don’t materialize. As a result, there are times in my own life when I find myself deliberately expecting the worst so as to cushion the blow in advance. Isn’t it better to brace yourself for disappointment and then be pleasantly surprised, instead of counting on sunshine and then getting a storm? I fall into that pattern more often than I’d like. But I also know, in my core, that this pessimism is no way to live. If nothing else, having faith in good outcomes guarantees me a better quality of life while I wait to see what happens. It makes me less cramped, less tense; it makes me lighter. That alone is worth the faith … even though believing can be darn hard to do at times. I’ve thought about this issue a lot over the last several years. There’s so much to ponder there; I certainly won’t be able to resolve all of my questions in a blog post. But even though I struggle at times to live up to the core messsage, I still love The Carrot Seed because it is a tribute to the beautiful faith of kids, a faith that — truth be told — I envy. This book makes me realize that I shouldn’t be too quick to “protect” them by introducing the possibility of worst-case scenarios. Faith comes so naturally to them; I want to honor and respect that. One day, there will be something that Daddy can’t fix, and Matthew will no longer utter that ringing statement of belief. But for now, I want to keep his sweet faith alive and growing. I want to water it and weed it and keep it thriving just as long as I possibly can. 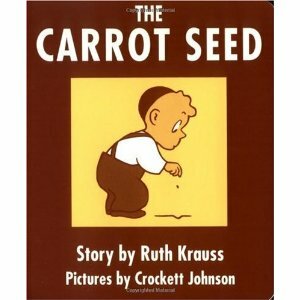 The Carrot Seed by Ruth Krauss, illustrated by Crockett Johnson. To read more about the Spiritual Books series of posts, click here. The Little Red Lighthouse and the Great Gray Bridge fits into the category of “children’s classics that I didn’t read till I became a mom.” I’m sure that this one bypassed my girlish radar because the cover makes it look like a “boy’s book” — there are no dolls, no ballet shoes, no cute little puppy dogs or flowery meadows or all the other triggers that used to make the very young me grab a book off of the library shelf and curl up with it on the floor. So I’m very glad that I get a second chance to discover this book, because it’s a gem … and it has sure gotten me thinking . In the book, a little red lighthouse sits in the Hudson River in New York City, warning ships away from the rocks. The lighthouse is cheerful and responsible, proud to have such an important job to do. And then, one day, strange men come and start building a huge bridge, a behemoth of a thing that totally dwarfs the tiny red lighthouse underneath. The bridge has a flashing light on top, one so bright that the red lighthouse becomes depressed, wondering what purpose he can possibly serve anymore. But then a storm comes, and a ship flounders and struggles, and the great gray bridge tells the lighthouse to turn on his light, quickly, and help the ship. “Your light is so bright that I thought mine was needed no more,” answers the lighthouse. “I call to the airplanes,” says the bridge. “But you are still master of the river.” He then utters the best line in the book: “Quick, let your light shine again. Each to his own place, little brother!” And the lighthouse is proud and happy again, knowing that he does matter, and that he is needed. The message to this story is pretty clear: each of us is indispensable. There is something so poignant about the little red lighthouse (the illustrations by Lynd Ward capture this beautifully) being overshadowed by the hulking gray bridge, yet coming to realize that he still matters, that he’s still needed. “Each to his own place, little brother!” The story assures kids (and moms!) that every one of us has something unique to give, even if we feel, at times, inadequate alongside those who are larger, flashier, newer … or all of the above. As a spiritual writer, I find this a particularly useful message. There are tons of us writers out there, tapping away at our laptops; at times, it’s easy to question whether it’s worth it, to wonder whether we can possibly say something about faith that is different or unique. What helps me is to remember the words of St. Paul, about how we are many parts, but all one body. If one of the parts isn’t there, the whole is diminished. Each of us looks at spirituality through the lens of our own experiences, gender, age, ethnic identity, personal likes and dislikes, hopes and questions and quirks, which means that we each have a unique perspective to offer. What is mine? I guess it’s the perspective of a thirty-something mom, a hybrid of Polish/German pragmatism and California optimism, a teacher and writer, a practicing Catholic who loves hanging out with people who aren’t. I’m someone who has had bad experiences with obsessive anxiety and good experiences with opening up and talking about it. I am an imperfect but enthusiastic gardener who believes, as the writer Beverly Nichols once said, that if all men were gardeners, the world would at last be at peace. All of this and more makes me who I am, and gives me a specific lens through which I see God and life, a lens through which I identify what really matters and how to get there. Other people will see those same things in different ways, through different lenses, and I thank God for that variety. This is why I love the big banquet that is my faith. There’s such diversity out there: one person may like the spirituality of St. Francis, another person may be drawn to the activism of Dorothy Day, another person may find God through the writings of Thomas Merton. There is something for everyone, and when we writers share our unique experiences of faith, we add more dishes to the menu. And this isn’t just about writing, either; it’s really a broader message, about finding your own calling. The trick to happiness lies in recognizing who we truly are, and what we alone have to offer; there’s no point in copycatting those who seem bigger or grander or more prominent. The great gray bridge can do a lot, but it can’t shine its beams where the little red lighthouse can. And on this river called life, every light matters. 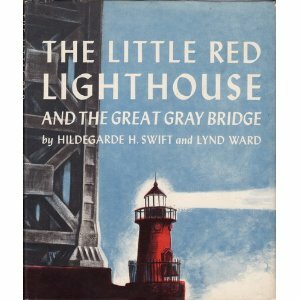 The Little Red Lighthouse and the Great Gray Bridge by Hildegarde H. Swift, illustrated by Lynd Ward. Click here to read more about the Spiritual Books series of posts. I bought each of my boys a special hardcover book for their first Christmas. I love any excuse to go to the bookstore, and it was a real nostalgia trip to revisit all those titles I loved when I was young. It wasn’t easy to choose, but when I was shopping for Lukey and saw The Story of Ferdinand on the shelves, I knew I’d found my gift. There is something so appealing about this book. I love the story by Munro Leaf, and the black-and-white drawings by Robert Lawson. I love how Lawson works in the real scenery of Spain (when I was a kid, my uncle, who did graduate research there, pointed out the pictures of places he had actually visited during his stay). And I love Ferdinand, the pacifist bull who wants nothing more than to sit under his cork tree and smell the flowers. I love him as a wobbly calf, and I love him later, when he is a large, placid, gentle bull. If you recall the story, all the other bulls are eager to be chosen for the bullfights in Madrid. They prance around, showing off, trying to look all macho and tough for the men who are coming to choose. Through a misunderstanding, the men end up picking Ferdinand, and yet he doesn’t play the game. When he gets to the arena, with all the cheering crowds and the ladies with flowers in their hair, he just sits and smells the air. Nothing the egotistical matador can do will make him get up and fight. In the end, they give up and take him back home to his favorite cork tree. “He is very happy,” the narrator tells us. I like the character of Ferdinand because he simply doesn’t care about glory, or fame. He’s kind of a bovine mystic, actually — all he wants is to be one with nature, quietly and without fanfare. Adulation and applause means nothing to him. His life is centered on what we would call mindfulness, and he doesn’t need anyone else to give that to him. He instinctively knows how to appreciate the moment, and his surroundings. As a mom, there are plenty of little moments with my kids where I stop and savor the experience. And yet there are also many times when I am looking at my watch, or counting the hours until bedtime and some time alone, or typing away at my laptop, half-listening to Matthew explain something about the complicated building block structure he is making at my feet. It is often hard for me to do the mindfulness thing when it comes to the daily experience of parenting, because my mind is often racing ahead to the thing that is more pressing, more intellectually stimulating. And yet time passes quickly, and kids grow up fast. There will come a day when they are out of the house, and I will think back to these days, and wish I had savored them more. Going for the glory of a splashy byline or a book contract is all very well, but I think I need a little more Ferdinand in my daily life. I don’t want any parenting regrets, somewhere down the road. So that’s what I take from this Spanish bull: a call to mindfulness. His story is a sweet reminder that we moms need to stop and smell the flowers, in the company of our kids, while we still can. 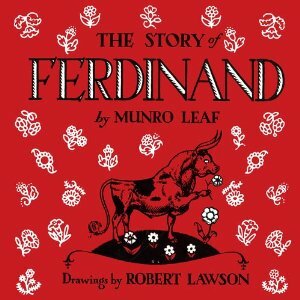 The Story of Ferdinand by Munro Leaf, illustrated by Robert Lawson. To read more about the Spiritual Books series of posts, click here. When I was pregnant with Matthew, a friend of mine gave me a flat wrapped package for the baby. From the shape of it, I could tell that it was a book — but which one? The wrapping cleverly offered its own clue: attached to the front of the package was a small card, to which my friend had taped a single purple crayon. Matthew, at the age of four, has grown to love Harold and the Purple Crayon. Really, what’s not to love? 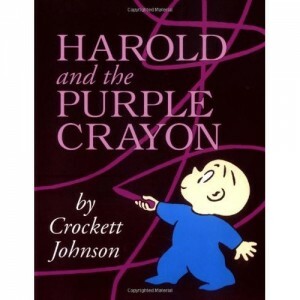 Harold is a resourceful child who creates his own adventures, all with a few strokes of his magic purple crayon. That crayon gets him into scrapes and out of danger. It takes him to exotic places. It even creates friends for him — who can forget the time that Harold was hungry and drew nine kinds of pie to eat, and then sketched a very hungry moose and a deserving porcupine to finish the leftovers? There is no problem that Harold’s crayon cannot solve, when paired with a boy’s ingenuity and imagination. And that, to me, is a worthwhile life lesson. Harold doesn’t just settle for what is; he makes his own world, quite literally. He is a little visionary in a saggy sleeper, not content to stay at home, eager to roam (though he does return to his own bed at the end of the book). He is the embodiment of creative possibility, and as such, he is a pretty inspiring character. In fact, many famous people have said many famous things about this very theme. The playwright George Bernard Shaw wrote, “You see things, and you say, ‘Why?’ But I dream things that never were, and I say, “Why not?” Gandhi once said, “You must be the change you wish to see in the world” — one of my all-time favorite bits of advice. 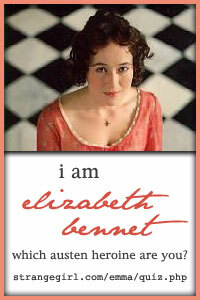 And Emily Dickinson, whose poems seem to have been to her what the purple crayon was to Harold, wrote, “I dwell in Possibility,/A fairer House than Prose.” Where would the world be if there weren’t people who looked around an empty space and said, “You know, I envision something really great right over there …..” Whether you’re building a hospital in a developing country or starting a moms’ group in your neighborhood, you’re doing the Harold thing … and it does make a difference. I think Harold also resonates with me because I’m a writer, and writers, by their very nature, create something out of nothing. Every story, book, and blog post begins with the spark of an idea, and there’s such a feeling of satisfaction to taking that spark and creating a world of prose where there was formerly nothing. That’s why Harold is such a great mascot for the writing life, or for the creative life in general. Like him, we can accomplish a whole lot before bedtime, if we are willing to grab that purple crayon and scribble away. Harold and the Purple Crayon by Crockett Johnson. To find out more about the Spiritual Books series of posts, click here.